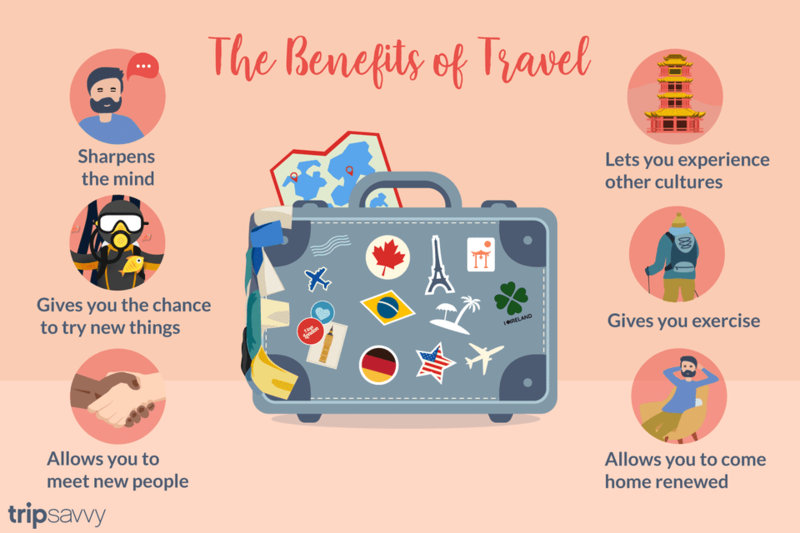 What Are the Benefits of Travel? Forget milling around in your finest evening wear, Singapore Sling in hand: you'll be lucky to get peanuts. Flying isn't quite the party it was in Sinatra's days, and lots of time, energy, and money are expended to leave home -- so why travel? How long do the personal benefits of travel last? Getting away from home and stepping outside of your usual routine is beneficial for both mind and body. The long-lasting personal benefits of visiting a foreign country far outweigh the costs and time to get there. The great travel writer Pico Lyer said: "Travel is not really about leaving our homes, but leaving our habits." Here are seven ways that travel, especially international travel, will enhance your life. You've done your old routine for so many years that you could run through it on autopilot. Being dropped into a new environment engages a dormant part of your mind and gets those synapses firing again. Suddenly, you'll be required to navigate unfamiliar places, read foreign languages, try new things, make quick decisions, and choose your new eating and sleeping schedule. Unlike at home, all the new sights, sounds, and places will require mental processing and filing. Your brain will welcome the workout! Once you return home, you'll be sharper than ever for better organizing and sprucing up your daily routine. Being exposed to new cultures and people will greatly shift your paradigm and create a healthier perspective once you return back home. Seeing different social classes creates compassion and really makes you feel more blessed and content. Large portions of the world's population have to deal with daily threats such as hunger, disease, and landmines. A hard day at work suddenly doesn't seem so bad when you see people in developing countries toiling in sun-scorched fields from morning to dark, or begging for a drink of water. While you may branch out at home from time to time by trying new restaurants or splurging on expenditures, traveling kicks you out of the comfort zone and forces you -- for better or worse -- to try new things! Even if you don't enjoy your first attempt at scuba diving, at least you'll be able to relate in a new way the next time you see it in a movie or hear someone talking about it. Becoming a well-rounded individual enhances self-confidence and will help you find new material for conversation in social settings with a wider variety of people. Who knows, you may accidentally discover your new favorite food or find out that you want to pursue a new career in karaoke! You'll meet far more friendly people on the road than you will under ordinary circumstances at home. Other travelers are always looking to share experiences, give tips on places to go, and meet people from all over. Striking up a conversation with other travelers is extraordinarily easy. A polite "so where are you from?" breaks the ice quite easily and may lead to lasting friendships with people from all over the world. Until you visit a place and form your own opinions, your understanding only comes from what you were taught in school, read in books, or saw on media -- which may or may not be the complete truth. Don't over research your upcoming destination in guidebooks. Do your best to avoid building a bias toward a place or installing mental filters before you visit. Wait to form your own opinion, remaining objective until you can make up your own mind. Sure, you could just go sweat in the gym under fluorescent lighting, but chances are that you'll be much more active from day to day while on the road -- regardless of whether your trip is an adventurous one or simply a relaxing beach trip. You could be exploring new cities on foot, hiking, swimming, walking between places, and hopefully soaking up some needed sunshine while doing so. And it's guaranteed to smell better than the gym. After stepping away from home for a while, you'll return with renewed energy, a new set of mental filters, and ready to take on the next big project or challenge. Call it a life reboot. Getting away for some time, even though it requires effort, will greatly enhance your attitude and productivity once you return home. Sure, you may have some mail piled up and matters to attend, but those are simple challenges easily knocked out. Breaking up the monotony for a while is a great way to reduce stress and give your life an injection of excitement. Don't be surprised if shortly after your return, you're already counting down days until the next trip! Love wildlife and nature? These trips need to be on your bucket list! Traveling solo? Consider booking a trip with one of these companies! Want to learn a new skill while traveling? Here's how you can do just that!